A. All that remains there in 2010 is what remains after the scrappers have had at it. But which scrappers? 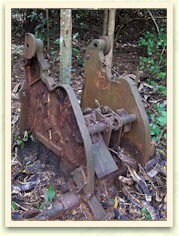 Under the trees, not far from a road near Battery Way is the metal frame of a Japanese 25mm twin mount AA gun. 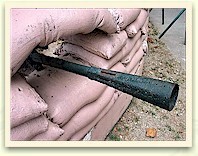 It is a little difficult to imagine this chunk of metal being part of an Anti-aircraft gun. 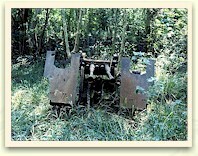 I had been told that post war it was relatively intact but became the prey of scrappers. 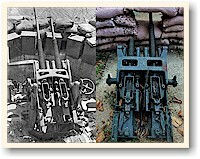 Thanks to Tony Feredo, a mid 1970s photo established this as true so we could all see what this gun actually looked like all those years after the war. Now the frame makes sense. 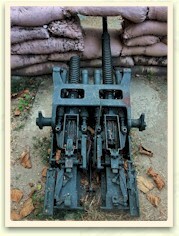 To clarify it even more, Martyn Keen has posted a rear view photo of a gun from a non-Corregidor location. Very interesting, but not the end of story. Occasionally something that you think was lost forever just seems to pop up right under your nose. 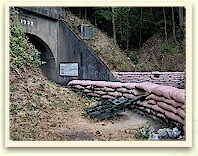 In January 2010 I was returning from Tailside towards the Corregidor Inn. My feet were telling me to take the shortest route so I headed for Malinta’s Tunnel’s east entrance then I would just walk through the hill to the Inn. It was around 4:45pm. Being in no hurry, I stopped many times taking photos along the way. While wandering around off to the left hand side of the Malinta Tunnel's east entrance, I noticed that the displayed gun seemed a little “wide.” Hmm, could it be? 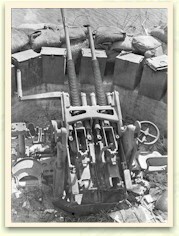 A barrel is missing from one of the guns near Malinta but this could have happened anytime after it was removed from the mount. Although the frames have slight differences when compared to Martyn's reference photo, the two are very close. 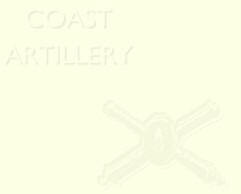 Obviously I cannot be sure this is the same gun from the frame near Battery Way, but that's the way the smart money is being bet. C. The faux emplacement of the Typ. 96 gives the east portal a sense of theatrical reality. D. That is to say, any similarity between this and what was here during WWII is purely coincidental. E. So where is the other barrel? 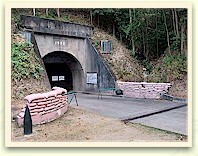 F. (Left) View of the Twin Mount at the east portal of Malinta Tunnel shows the strong Hotchkiss character of the weapon.